Elbows are complexed. They are one of the few places in the body where 3 bones interplay with one another. It is a stable but mobile joint. In order for our hand to turn palm up and palm down (supination/pronation) there has to be this element of rotation at the elbow. This happens via the radial head. 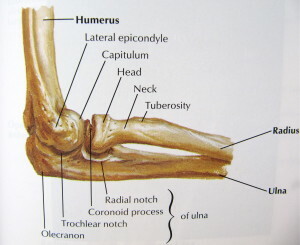 Look below and you will see the ulna is fixed (does not rotate) and works like a hinge on a door. The radius however looks much different. It rolls and enables the hand to turn palm up or down. When this roll becomes limited it can gunk of the whole works. Lets not let that happen. 2. Spend 2-4 mins performing today’s radial head mash.